Patience Lister has been conducting research on natural health products and functional food since 2005. She has been writing since 2009 and has contributed to "Canadian Running Magazine," "iRun Magazine" and "The Vancouver Sun." Lister has a Bachelor of Science in biology from the University of Victoria and a diploma in food technology from the British Columbia Institute of Technology. Red meat is a complete and high source of protein that is easy to digest and contains all of the essential amino acids that you need for good health. During digestion, your body breaks the protein from red meat down and your cells use it to build specialized types of protein. Another way to get the same amino acids content that you get from red meat is to eat specific combinations of plant-based foods. Amino acids are the components that make protein. You need 22 specific amino acids to build the proteins found in most parts of your body, including muscles, red blood cells and immune cells. Because your body can only produce 13 amino acids on its own, you need to get the other nine from your diet. These nine are considered essential because you need them to maintain a healthy body. They are histidine, lysine, threonine, methionine, isoleucine, leucine, valine, phenylalanine and tryptophan. Although you can get amino acids from both plant- and animal-based foods, only animal protein contains all nine essential amino acids. When cooked, a 100 g serving of red meat can provide more than 28 g of protein. All red meat and most other animal meats are called complete proteins because they provide you with all of the amino acids that your body needs. In contrast, plants are incomplete protein sources because they do not contain all of the essential amino acids that you need. Nutritionally speaking, the protein in red meat is a higher quality than that from plant sources because it is easier for your body to digest and break down into amino acids. When you eat red meat, your body uses digestive enzymes to break the protein down into a more usable form. This process, called hydrolysis, breaks the links that hold long chains of the protein’s amino acids together. Once these amino acids are released, you absorb them into your blood and distribute them to cells throughout your body. Your cells use the amino acids in different combinations to build the specific types of protein that they need. The protein in red meat also makes it easier for your body to absorb important minerals such as iron and zinc. The Centers for Disease Control and Prevention recommend that you get 10 percent to 35 percent of your daily calories from protein. This equals approximately 46 g of protein for women and 56 g for men. You can meet these recommendations by eating complete protein sources such as red meat or by eating incomplete proteins in combinations that provide all nine essential amino acids. Although red meat is considered a quality source of protein, some types contain high amounts of saturated fat. To keep your intake of bad fats to a minimum, choose lean cuts of red meat and eat it in moderation. 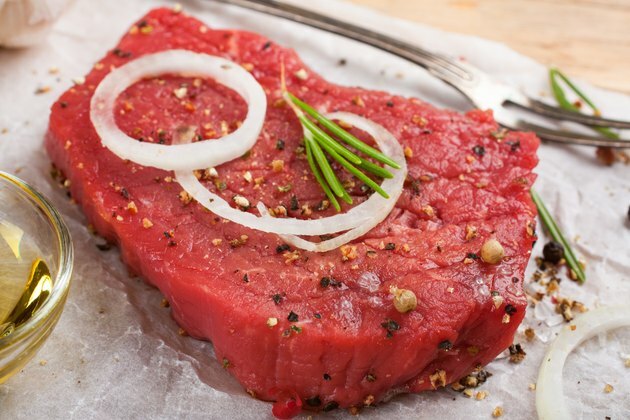 While there is little evidence showing that red meat increases your risk of disease, substituting it with other sources of amino acids such as fish and nuts can lower your risk of colon cancer and heart disease.